With the first round of voting complete — and no upsets from our seedings — we head to the second round of voting in Best of the Ballparks for the Florida Grapefruit League, as we narrow the field from eight to four. And we need your help! Help us select the best Grapefruit League ballparks! With games now underway, it’s time for Spring Training Online readers to select the best ballparks in the Cactus and Grapefruit leagues. Welcome to the first round of the Best of the Ballparks fan voting, as we turn attention to Florida’s Grapefruit League ballparks. 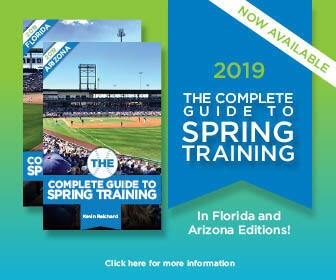 Now on Sale: The Complete Guide to Spring Training! The schedules are out. The tickets are on sale. Three feet of snow fell on the East Coast. A huge storm is predicted for the Midwest. You know what to do: plan your spring-training trip. And we are here to help.